The wheels of the Voyager truck have been covering a lot of miles this year, with a full calendar of travel and discovery in places near and far, large and small, quirky and familiar. Our scientists and educators love inspiring science learning through play while helping create a platform for natural curiosity, and the great diversity of schools that we visit makes this even more rewarding. Our on-the-road team has also been busy taking our activities, equipment and enthusiasm to quite a number of festivals and events! We kicked off with the gem and rock festival, Minerama, in Glen Innes in early March, closely followed by the World Science Festival in Brisbane, where our team were at home alongside 24 other fantastic teams of science educators and tens of thousands of members of the public – some 6,000 of whom engaged directly with UNE Discovery! Meanwhile in Sydney, the UNE presence at the Royal Easter Show was immense, and Discovery richly augmented the Farms of the Future pavilion with highly engaging, positive, and educational activities for people of all ages. Some 200,000 people passed through this pavilion alone at this year’s Show, and many of them stopped to explore interactive displays, have a chat with the UNE team, peer down a microscope, experiment with soil chemistry, or try out the programmable robot crop models and learn about precision agriculture and technology. 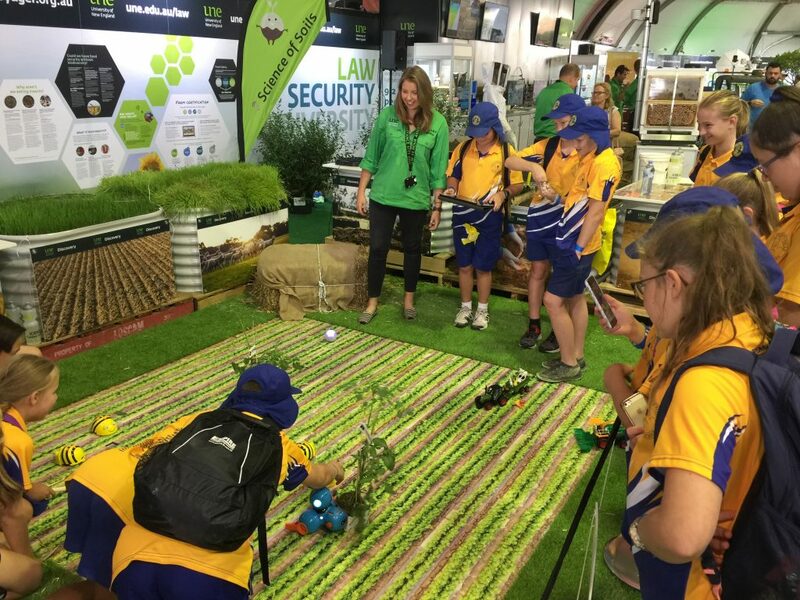 More recently, and closer to home, we partnered with Telstra while bringing ant studies, microscopes, Beebots, erosion demos, and a whole lot of science expertise and enthusiasm to AgQuip in Gunnedah. A massive primary industries field day, AgQuip attracts over a 100,000 people amongst countless exhibitors of agricultural products and services. The events we participate in aren’t really about numbers, they’re about impacting attitudes towards science in everyone from toddlers to great-grandparents. We normalise science by bringing it into people’s lives, at schools or festivals, and by sharing it in friendly, accessible, and fascinating ways. Our model of engagement is all about being hands-on and learning through doing: which often includes getting dirty; making mistakes; and asking those ‘silly’ questions! Activities for kids, especially science activities like ours, aren’t always woven into the fabric of the events we go to. Everywhere we go, we see the smiles on people’s faces, the spark of understanding a new idea, and the bright interest in how amazing science can be. As with our school visits, these events connect Discovery, and the University of New England, to our region. By nurturing this connection we are contributing to a love of science in rural Australia, but we’re also encouraging a lifelong journey of education – founded on curiosity, a can-do attitude, collaboration, creativity, and confidence – in our broader community. What starts as a puzzled look down a microscope at a festival becomes a doorway to conversations about science, legitimising children to study science, and perhaps the pursuit of it through to tertiary study and beyond. All this is central to the Discovery vision: the investment in our future scientists and problem-solvers, the sharing of passion, the coming together to learn, discuss and explore. Being part of major events like AgQuip, the Royal Easter Show and the World Science Festival allows us to contribute to the public dialogue of science and scientific literacy in our society. That’s one of the joys of science education! If you’re around, on the Saturday it is open to the public, so come on down and say hi – you never know, you might discover something new!